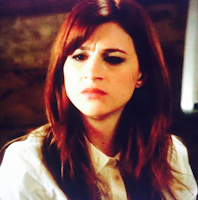 I said in my recap of last episode's You're the Worst that I was nervous. Now do you see what I mean? I have no idea where Gretchen went, though I think we're meant to suspect that it's Ty that she's returning to; not only because we have no idea where else she would go but because Stephen Schneider is hilarious in the role and he would be fun to see again. Also, I have to assume Gretchen's not going anywhere noble. She's using the phone specifically designed for "garbage people" and is leaving Jimmy in the lurch (and, in effect, the audience as well). So why did Gretchen do it? I think that You're the Worst did the best job possible in setting the stage for something that they really didn't set the stage for at all. For example, we didn't hear Gretchen ever voice her hesitation, nor do we see long, lingering looks at the ends of scenes to point to us her train of thought. Instead we are left with two things. One, on our end, is the fact that this episode deliberately toys with our suspension of disbelief. Did anyone else feel that things were too good, too saccharine, between Jimmy and Gretchen? That there was something a little too tender about the plot that they were sharing –– specifically, that Jimmy and Gretchen promised they wouldn't check in with each other but checked in with each other anyway, and at the end of the day Jimmy says, "Aren't you happy we didn't check in with each other?" It seems almost impossible that these two characters, who have been kicking and screaming their entire courtship against falling in love and other permanent adult fixtures, would be so okay with this. The scene before the one where Gretchen leaves ends in a fade-to-black –– something you see on a laugh-track, cutesy sitcom, not You're the Worst. The only outward moment that pointed towards Gretchen's leaving was one expression that occurred so quickly that it only really came into itself in retrospect –– when Jimmy takes Gretchen's six-month check without pause and cashes it in. She's made a six-month commitment; he's accepted it within seconds, without any fuss. So, in a sense, this episode is "All About That Paper." This moment is the turning point that verifies our own discomfort with Jimmy and Gretchen's domesticity; it's the moment when Gretchen understands totally what trap she has fallen into and what she is hard-wired to run away from. But it's not just about the paper, obviously. It's about the recurring pattern that we've seen in the first couple of episodes where Gretchen and Jimmy are fighting against their own permanence. Jimmy had his moment two episodes ago, when he watched Gretchen move into his apartment with ease. He didn't run, though. But Jimmy's biggest flaw isn't that he's scared –– at least, not like Gretchen. Jimmy is more the hopeless romantic than Gretchen is. Jimmy is the one who tried to propose to Becca; Gretchen is the one who broke up with him whenever she believed he wanted to propose to her. Remember the first episode? Jimmy said that he "didn't believe in" love; Gretchen said she was scared of it. In a story like Jimmy's, love surprises and ultimately redeems. Jimmy doesn't believe in love because he has never before experienced someone accepting him entirely for who he is; his belief is that love makes you into a "boring normal," when in reality love is finding someone who you don't always have to be presenting to –– which is boring but, said another way, undramatic. Comfortable. In a story like Gretchen's, love terrifies. The worst part is that Gretchen's fear directly challenges Jimmy's cynicism. If she runs away from him, it is a self-fulfilling prophecy for him that not even someone like Gretchen can leave his heart unbroken, and an encouragement that he should continue to isolate from others. "All About That Paper" also comes up for Jimmy in the form of the money he gets from the writer who asks to spend a day with him. He takes the guy's money but doesn't buy into what the guy is selling him –– the big writer-y gestures and projects or the book the guy has written. This is similar, I think, to Cory and Gretchen in the last episode –– that one character is introduced to intentionally remind us how much our main characters have changed from their worst selves –– and the conclusion of this episode (and Jimmy's confidence in his writing) is more about showing that for Jimmy, writing is never a chore or an activity he engages in because of his pretentiousness –– it's something pure and raw. So Jimmy, who has always felt socially shunned, has found an outlet in writing. Jimmy needs money, and is "all about that paper," but isn't willing to give up the reasons why he started writing in the first place to make it. Paper comes up for Lindsay, too –– in the form of the divorce papers sent to her by Paul. This, also, is about more than just the piece of paper; it's about more than the stated "irreconcilable differences." It's about why they got married in the first place, why Lindsay started to become unfaithful, why Paul decided to become unfaithful, and the romantic moments they have shared since they separated. Paul isn't breaking up with Lindsay just because of irreconcilable differences; it's because he is trying to get rid of the part of him that is still holding onto her. I have to confess that I didn't like this episode of You're the Worst that much. While it was funny and followed the same tight structure that previous episodes have, I felt that the four plots going on (Jimmy and the writer; Gretchen and the "rap beef"; Lindsay and the insemination attempt; Edgar and the improv) were all too broad and silly. But maybe that's all in service of the final scene, which was shocking and devastating –– made better by Aya Cash's silent performance and the accompanying music which hammered in the themes You're the Worst has been showing us all along: "Lay off me, would you? / I'm just trying to take this new skin for a spin." PAUL IS STILL THE WORST. Sure, he told Amy about sleeping with Lindsay, but I bet he didn't tell her about watching Lindsay in the last episode! With that being said, if the insemination attempt is successful, I will be a lot less impressed with this show. She froze the hours-old sperm, microwaved it, put it in her wine cup and then used a turkey baster –– there's too much implausibility for this to seriously work. I would so, so much rather Paul/Edgar find out about the attempt than for Lindsay to become pregnant and then get an abobo. But with all this baby talk lately I can see that being the direction the show goes in. I don't really like babies on TV, but I would feel so icky if Lindsay revenge-impregnated herself and then got a guilty abortion. I still, forever, and ever, love Gretchen's rap crew. The beef was over-the-top, but I always love their brand of over-the-top.